TOTEM is a bestiary of the apparitions, the images, and the ghosts that haunt the Italian-born and Bangkok-based artist Andrea Pironi. The artworks represent a profound visual dialogue with many of the world´s most distinct iconographic traditions. Half pagan, half sacred, Piro succeeds in building a new religion, mixing Mayan glyphs, Incan rock carvings, North American totem poles, South Pacific spell books, Easter Island and Angkor Wat, via Manga and 80s skatestyle. The exhibition will show 4 new large-format works, in conjunction with the show, SHS Publishing is proud to present the author´s first book. Collecting more than 126 original artworks, the publication is a unique work of art itself. Printed on a 1980s Duplo Printer, and hand-bound in Ravenna, Italy, TOTEM comes in a limited edition of 70 copies, all numbered by stamp. 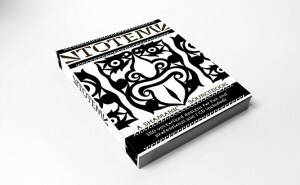 At the same time homage and satire, serious reflection and playful parody, soothing, gruesome and witty, this book constitutes a pantheon of deities and demons from a secret religion.TOTEM is about both the representation and evocation of power itself, and it will be of inspiration for designers, artists and witchdoctors alike.